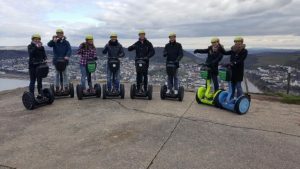 A unique Rheingau Tour experience! Experience our beautiful wine region and renowned UNESCO World Heritage Site. Our tours for English-speaking guests accommodate up to 24 participants. 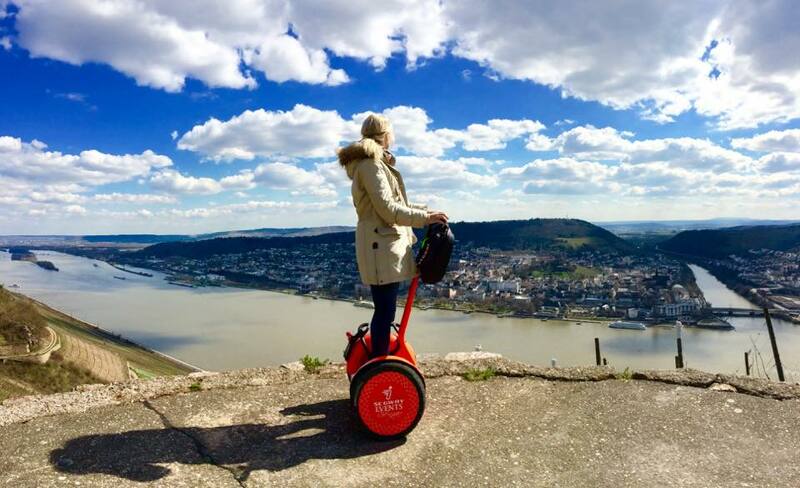 With a Segway you can ride almost silently through the stunning Upper Middle Rhine Valley, a UNESCO World Heritage site since 2002. Thanks to this unique mode of transportation, you can enjoy our hilly landscape (there is a reason the Romans planted vines here!) at a leisurely pace and completely relaxed. Roll with us along the River Rhine, get to know some of our historical sites and enjoy the high-quality foods of the Rheingau. 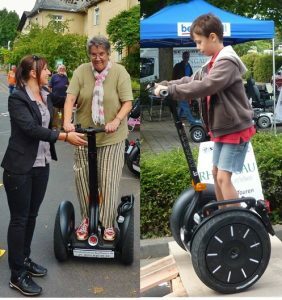 Segways are easy to use and everyone aged 15 and older can participate in our tours – with appropriate drivers licence. 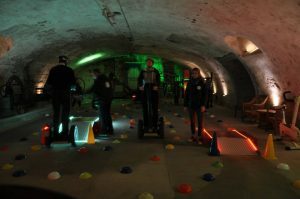 All tours start with a 20 to 30 minute instruction on driving and controlling your Segway. Tour de Rüdesheim — Join us to explore the gateway to the Upper Middle Rhine Valley UNESCO World Heritage Site. The tour leads you from the market square in Rüdesheim along the famous Drosselgasse and through the town centre. Our tour then takes us through the vineyards, along the former Asbach factory site, to the Ehrenfels castle ruin. From here, we take a path through the Niederwald forest to the astonishing Niederwald Monument. After visiting the Niederwald Monument, we take a break at the Rebenhaus, which offers fantastic views over the vineyards and the Rhine valley. Finally, after about 2.5 hours and a 15-kilometre long ride, we arrive back where we started. 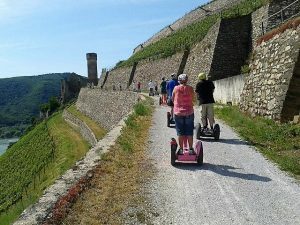 Citytour Rüdesheim — We ride through beautiful Rüdesheim and get to know some of the sights and historical background of this ancient town. The tour lasts about 1.5 hours, including the introductory instruction.